Should a Desire for Color Change Warrant Refinishing a Fine Violin? The finish on antique and modern fine stringed instruments is applied painstakingly for reasons of acoustics. Refinishing an instrument for aesthetics is not recommended. One of history’s great, unsolved mysteries is what makes the sound produced by the finest of Italian violins so magnificent. One theory holds that the wood available to the likes of Stradivari, Guarneri and other master luthiers of the 18th century came from trees that grew in the “Little Ice Age,” a time (about 1645 through 1750) when cooler temperatures in Europe caused trees to grow more densely. But careful analysis at Cambridge University (by scientists C.Y. Barlow, PhD. And J. Woodhouse, PhD.) of wood fragments from fine “name” instruments, including at least one Stradivarius, found that the treatment and finish of the woods were also important factors. Using a scanning electron microscope, they identified at least two layers of finishes applied to these instruments: a particulate “ground” layer laid on the wood first, over which the varnish layer was applied. The varnish itself was likely applied with a brush in at least two coats, often more. The oils used might be linseed or walnut, with coloring and oxidized resins. Additional color is achieved by way of “lakes,” which are organic pigments sourced from brazilwood shavings (“verzino”), cochineal (“carmina”) and madder root (“robbia”). These lake particles are suspended in the varnish layer to achieve a wonderful visual effect: light is refracted in multiple directions, creating what might be described as a luminescence. To understand this is to know why refinishing a fine violin, cello or viola is not an endeavor to be entered into lightly. This applies to more than the fine antique stringed instruments. 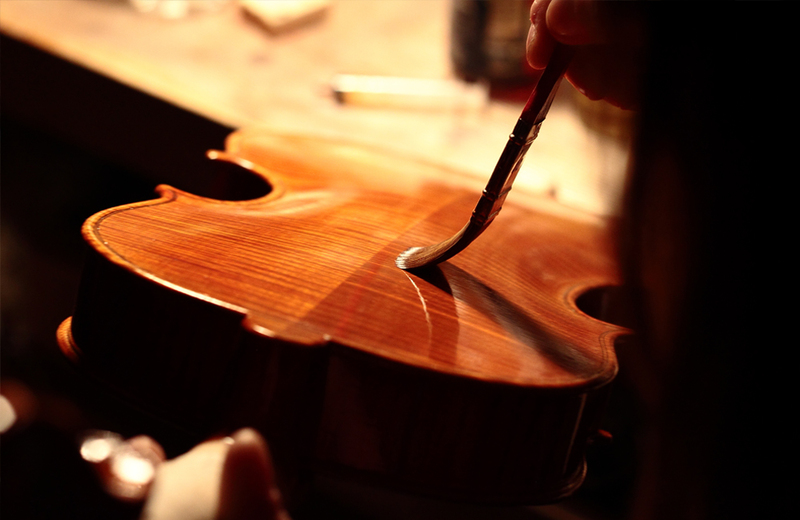 In a typical high-end violin shop of today, fine violins continue to be made with an exacting process. Most luthiers will expose the constructed violin to sunlight (or artificial UV rays) for several days to darken the wood before applying the “ground” sealer and coloring. The seal coating, which is to make it impermeable to moisture, also hardens the finish and creates uniformity. The impact of the ground on sound is that it distributes the vibration of the strings across the entire instrument. Of note, factory-made instruments may not have a ground layer at all – a cost-cutting measure that explains why such instruments can be purchased or rented by students who have yet to get serious about their instruments. Interesting to note also is that hand-made, fine stringed instruments follow no industry standard. Every luthier works according to their own methods, and many of those methods evolve and are closely held. The ground and finish are part of the whole, complementing everything else that goes into making fine musical instruments. It defies reason to refinish such a work purely to achieve an aesthetic goal. The impact of doing so could adversely affect what the instrument is intended to do: create fine music.